Yoshinori Niwa, a Japanese artist based in Berlin [sic], has the solution. Simply place the offending National Socialist memorabilia in the container provided, and that “questionable” past will be thrown away. The ominous black clothes containter with those instructions in a public square where, 80 years earlier, thousands cheered Adolf Hitler, must surely be the most provocative artwork in the 51st edition of the Steirischer Herbst festival in Graz, Austria’s second city. Mr. Niwa’s installation is on the Hauptplatz, where Hitler addressed crowds in March 1938 when he visited Graz to celebrate the annexation of his native Austria by Germany. More recently, concerns about immigration — Graz is just 30 miles from the border with Slovenia, a favored entry point to the country for refugees in 2015 — have seen this affluent nation lurch to the right. Austria is now governed by a coalition of the conservative People’s Party (ÖVP) and the populist Freedom Party (FPÖ). The extent to which Austria collaborated with, or was a victim of the Nazi regime during World War II is a decades-old national debate, underpinning unease about the rise of far-right parties. “I’m at the Nazi container,” said one young woman on Monday, talking into her cellphone, before wandering off to catch a tram. The artist has, however, been targeted on social media. “You are a great shame for humanity. Just throw yourself into the container,” was one of the more extreme comments directed at Mr. Niwa on Facebook. 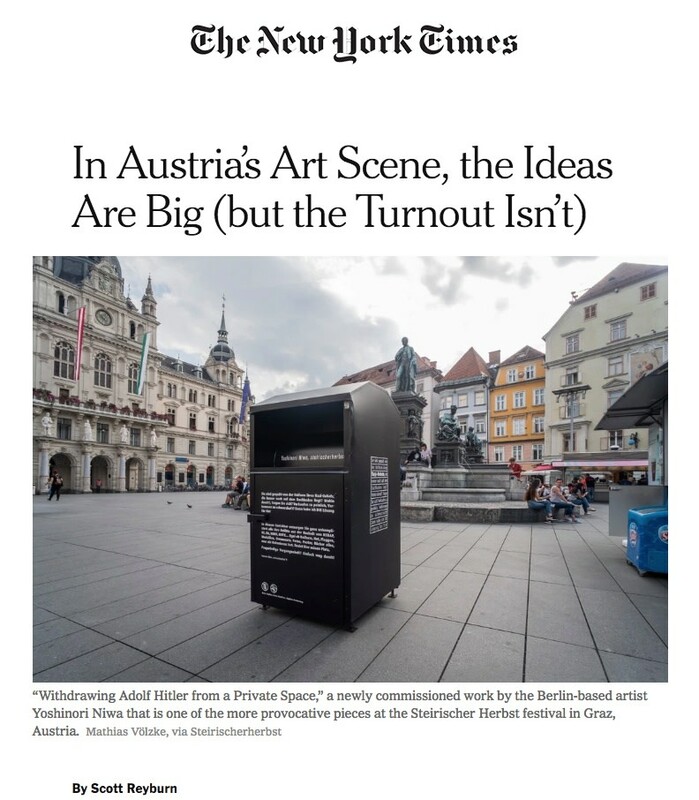 At the same time, at least two of the few individuals who dropped items in the bin have agreed to be interviewed on video by the artist, according to Christoph Platz, head of curatorial affairs at Steirischer Herbst. Heavy on ideas, and on artists from the former Eastern bloc, the publicly funded festival exposes the roughly 270,000-strong population of Graz to projects including “Anschluss ’90,” by Henrike Naumann of Germany, a furniture store filled with the sort of postmodern kitsch that might have been created if the newly reunified Germany had annexed Austria again. Another, “Snow from Yesteryear,” by Irina Korina of Russia, is an assemblage of giant inflatable sculptures subverting the national pride Austria feels in the beauty of its landscape. On Monday afternoon, these Biennale-standard installations were deserted. But unlike the Venice Biennale, this wasn’t an art festival where gallerists were on hand to help with sale enquiries. A lack of footfall is an continuing concern for small and midsize commercial galleries, as was clearly the case on Tuesday, 120 or so miles to the north in Vienna. The Austrian capital, recently ranked the world's most livable city by the Economist Intelligence Unit, is currently hosting "Curated by Viennaline," a collaboration of 21 contemporary dealerships that put on exhibitions devised by invited curators. Vienna has a reputation for having superb museums, but not much in the way of a happening art scene. The four-week “Curated by” initiative, now in its 10th edition, combined with the annual Vienna Contemporary fair, which opened on Wednesday, is designed to give the international art crowd a reason to visit the city other than to admire masterpieces by Schiele and Klimt. At the gallery Crone Wien, Mark Rappolt, the British editor in chief of ArtReview, structured a show around a video documenting how, in 2000, the German theater and film director Christoph Schlingensief set up a “Big Brother”-style detention center next to the Vienna Opera House. Made out of shipping containers, the center held 12 asylum seekers, one of whom the public would vote off each day (for subsequent deportation), eventually leaving one lucky “winner” to become an Austrian citizen by marriage. At the time, Mr. Schlingensief’s “Please Love Austria” project created a furor in Vienna and beyond. Now its Swiftian edge can be enjoyed in the peace of an empty gallery (at least, that was the case on Tuesday afternoon). It was also peaceful at Galerie Martin Janda, where the Barcelona-based curatorial office Latitudes had put together a group show that included photographic works by Sean Lynch of Ireland and sculpture by David Bestué of Spain. Prices ranged from 6,000 euros to €20,000, or about $7,000 to $23,000. No sales had been made at the gallery since “Curated by” opened on Sept. 14, according to Mr. Janda. On Wednesday, however, at the opening of the Vienna Contemporary fair, Mr. Janda quickly sold two small lyrical mixed-media works by the admired Croatian artist Mladen Stilinovic, who died in 2016. Priced at €12,000 each, they were bought by a Swiss collector. Now in its fourth edition in the spectacular venue of Marx Halle, a cast-iron former meat market, Vienna Contemporary, which ends on Sunday, this year featured some 110 exhibiting dealers, about 40 percent of whom are based in Austria. Unlike at next week’s much bigger Frieze London fair, no American galleries feature on the exhibitor list. For some visitors, the regional nature of the event is a compelling plus. Mr. Austin, like several other visitors at the opening, was attracted to the booth of A.C.B. Gallery, based in Budapest. A.C.B. was showing Bauhaus-influenced enamel abstracts from the 1960s and ’70s by Ferenc Lantos and Sandor Pinczehelyi, Hungarian artists associated with the neo-avant-garde “Pecs Workshop” group. These were priced at between €12,000 and €30,000, but as yet unsold, according to Rona Kopeczky, the gallery’s co-artistic director. Last year, Vienna Contemporary attracted about 29,000 visitors. The liberal-leaning art world, or at least a section of it, will always show up to a well-organized fair in a destination city such as Vienna, as it will to openings of serious exhibition shows and prestigious festivals, such as Steirischer Herbst. The challenge these events face is to get the rest of the world to show up. Or even the rest of Austria.